Dubai is famous for its Desert Safari for tourists along with world famous landmarks. Experience the Xtreme Desert Dune Bashing in UAE!!! 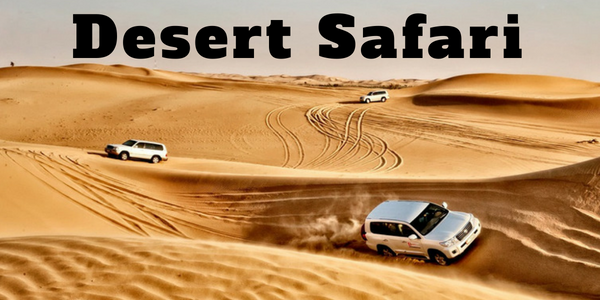 Our Desert Safari guide will pick you from your hotel by 4x4 by vehicle of an expert driver and set off for a journey into Dubai Desert. The Highlights of the Tour is the thrilling desert drive over the red sand dunes, Dubai sand ski and have a great opportunity to take the spectacular sunset view. You can try also the camel ride, Arabic attire and free henna tattoo on the camp with the unlimited refreshment and buffet choices of vegetarian/non vegetarian food. Pick up and drop off from your hotel or residence in Dubai / Sharjah (Sahara Centre Dubai side) by 4x4 vehicle. Desert Safari Time pick up 15:00- 15:30 drop off @ 21.00 - 21.30 hrs. Best Viewed at 1024 x 768 pixels and above. This Page loaded in 0.04022 seconds on Fri, Apr 19, 2019 (06:36).